We'll be honest - we're writing this Week in Gaming through a haze of dizzy delirium. From going hands on with the Xbox One console to salivating over the next era of GTA multiplayer, there's been no end of things to keep us busy over the past seven days. We'll kick off with the one that everybody's still buzzing about - the big reveal of Grand Theft Auto Online. Rockstar tore off the wrapping and showed us exactly what we can expect from the new multiplayer of GTA 5, and it's even better than we expected. But is it an MMO or isn't it? Good question, glad you asked. While only 16 active people can join in at one time, the world is persistent and each player has permanence in their actions, from buying property to customising their character. So it's an MMO so long as the first M stands for Minor. Also, let's face it - an all-out GTA MMO would just be manic. People would jump red lights, there'd be parking on the sidewalk. Absolute chaos. More decision-reversing from Microsoft this week as the company announced that the Xbox One will no longer require Kinect to function. Now, Microsoft isn't breaking its commitment to Kinect and insists that it's still integral to the whole Xbox One experience. A lot of features will be unavailable when the device is unplugged too. But this should appease those concerned about Kinect being used as an Orwellian spy tool, always watching and listening to our every word. The PS4 and Xbox One are becoming more and more similar by the day. In fact, we're getting to the point where we can barely tell the difference. Is this what we really wanted? Then lo and behold - an Xbox One appeared right in our office. So of course we didn't waste a moment and got our fingers all over it. Check out our hands on with the unboxed Xbox One below. Hell, you might even learn something. Peter Molyneux told us that he thinks the backlash on the Xbox One has been unfair and we reckon he might have a point. Is it just us or has the Half-Life 3 news been gathering a bit of pace recently? There was more this week, but unfortunately not the good kind, with Valve voice actor John Patrick Lowrie coming forward to say that he believes the game is not in development. According to Lowrie, who provided voice work for Half-Life 2 and Team Fortress 2, the problem that Valve is facing with HL3 is motion capture. While characters in the second game would follow you with their eyes when talking to you, motion capture doesn't allow for that yet. He did add, however, that voice actors are always the "last to know anything" so we shouldn't take his word as gospel. We'd reckon it's pretty unlikely that Gabe and his team aren't working on Half-Life 3, and our argument is simple: money. 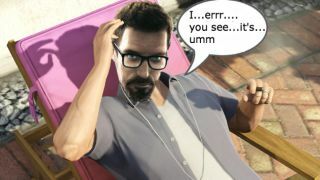 Lots and lots of lovely money that Valve will be rolling in the minute it sends Gordon Freeman back out into the world again. However, he's likely right about the motion capture aspect of the game. And hey, we're happy to wait a little bit longer if Valve is going to make it worth it, right? What? We're not? Oh. And while we're on the subject, former Steam icon Jason Holtman has just been picked up by Microsoft to head up its PC gaming.